July 1941. 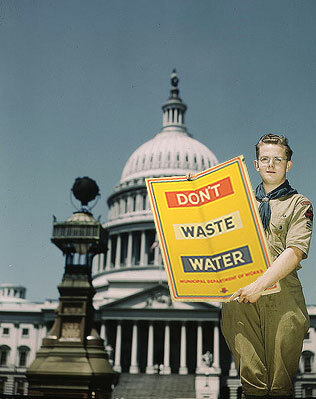 Local Boy Scout Anderson Grimes in front of the U.S. Capitol building in Washington, D.C., holding a copy of a WPA poster designed for the city’s landmark water conservation program. Shortly after this photo was taken, he was to present the poster to local congressman Harford Collins in a brief ceremony. Tragically, Grimes, along with several local reporters and congressional aides, instead found Senator Collins slumped over his desk, dead from a heart attack. Thirty years later, Grimes ended up serving the same seat in Congress for four terms. He did not die in office. I can’t find either Anderson Grimes nor Harford Collins listed in the Congressional biographies. Were they U.S. Congress Members, or members of the Maryland State Legislature, maybe?